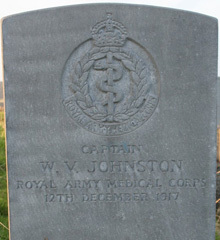 William Vincent Johnston was a son of Ronald Johnston. William was born in Donaghmore, County Tyrone about 1873. William Johnston was married to Elizabeth Carr Johnston. Elizabeth was from Dublin. They were married about 1898. 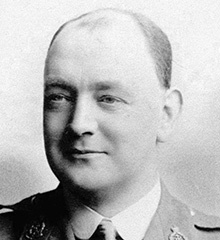 William’s became a doctor and lived with his family in Rathmines, Dublin. Captain Johnston died suddenly of heart disease. The death took place with tragic suddenness in the Military Hospital at the Curragh on 12th December 1917 while he was acting as orderly officer on Tuesday evening of the 11th December and was found dead in his bed early the following morning. He was 44 years old. Curragh Military Cemetery is situated on the eastern side of Curragh Military Camp, 3 miles south-west from Newbridge, and 4 miles south-east from Kildare.